The Carian Trail is an 820km coastal walking trail in southwest Turkey. It stretches from the Mediterranean to the Aegean Sea following glorious landscape and overlooking stunning viewpoints as it goes. Winding through the ancient region of Caria, this trail is an incredible way to discover forgotten history and see first hand exactly what makes this region so special. The Carian era arose as early as the 11th Century BCE and colonisation took place largely along the coastline. It isn't the easiest of walking routes; it leads hikers over bumpy paths and narrow tracks, stone-paved caravan roads and old mule trails - but the rewards are well worth it! The route uncovers a landscape rich in history and ancient ruins, and the views of the coastline are unmissable! This is a fairly new walking trail that was only properly mapped out in 2009 and finally opened for travel in 2013. This means that much of the trail explores still relatively unknown areas of Turkey, from the rugged coastline through clusters of pine forest or olive groves and into the mountainous hinterland beyond. 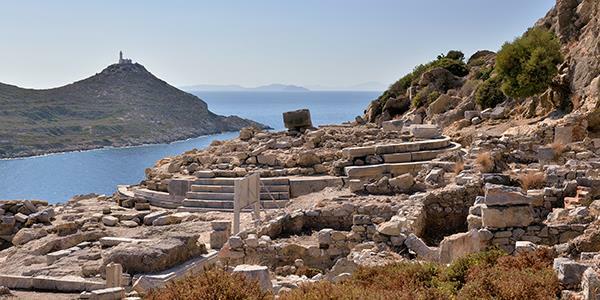 It'll guide you through famous historic locations such as Amos, Knidos and Stratonikeia. 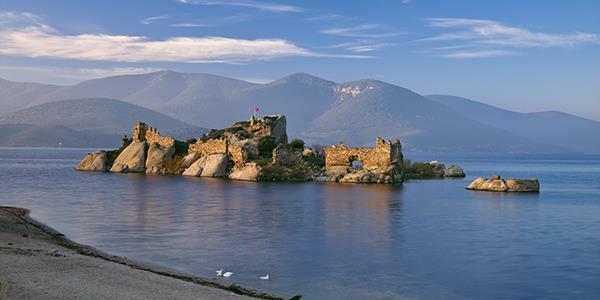 Along the way you'll find an unspoilt side of Turkey that is full of colour and tradition. With such a distance to cover, the trail can be broken down into manageable sections. You can walk the whole thing, or just choose one preferred section to explore. The route is fully signposted and waymarked, allowing both independent and group travellers to walk it. If you are attempting it on your own it is worth buying the guidebook or map, both of which you can purchase from the website here. The official start of the Carian Trail is in Içmeler, just a short distance from Physkos at the northern end of the Bozburun Peninsula. This is the peninsular to the west of Bozburun, and this section of the trail begins in the old town of Datça. Keep your eyes peeled for the characterful mountain goats roaming the hills. A narrow gulf of the Aegean Sea lies to the north of the Datça Peninsula and the third portion of the trail walks you along the coast westwards from Akyaka to Bodrum. From the Gulf of Gökova, the trail meanders north into the Carian countryside, and reaches the shores of Lake Bafa, continuing upwards to the summit of the Latmos Mountains. Along the way you'll find ruined monasteries and ancient cave paintings. This section concludes in Karpuzlu. This part of the trail is mostly cyclable if you fancy a change from walking. It explores the region of Mugla and concludes at the ancient city of Stratonikeia, where you'll find impressive remains such as the large theatre, a temple and Roman bath. The site is now protected as a UNESCO World Heritage Site. 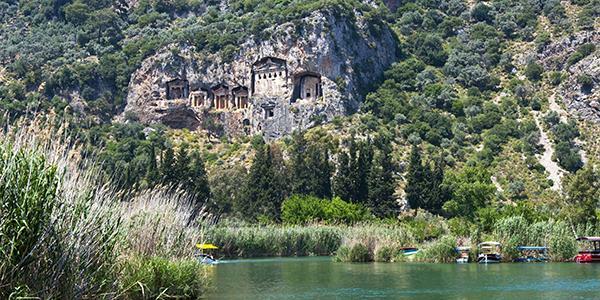 This final short little section begins in the town of Dalyan and incorporates a visit to the famous ancient city of Kaunos where you'll see archaeological remains and stunning rock tombs etched high in the cliff. If you're staying at Physkos, you really don't have an excuse not to try out a section of this incredible trail. 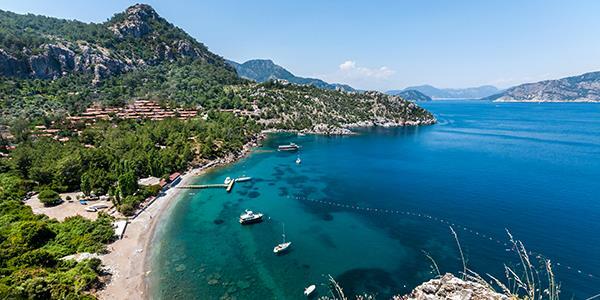 Içmeler, the official starting point, is just the next town along the coast from where you're staying. If you weren't keen on attempting parts of the trail yourself, you'll be interested to know that there is a Theme Week planned that will be taking guests from Physkos on a week-long hiking trip to discover the best bits of the Carian route. The week has been planned in a way that allows you to pick and choose the days you'd like to participate in, if not all of them. The shortest walking day will be 8km and the longest will be roughly 14.5km... So this isn't one for the faint hearted! Good walking boots are a definite requirement! If you're new to Physkos you can order a free brochure by popping your details in at the bottom of the page and learn a little more about the location and the Theme Weeks that take place.